The owner of a record-breaking hen who had consistently delivered five clutches of chickens per year said he is devastated after the hen passed away this morning at the age of four-and-a-half years. 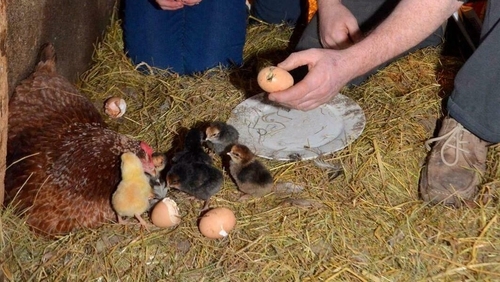 John Dolan from Banagher in Co Offaly had been seeking to have his hen, which he named Marmalade, listed in the Guinness Book of World records last year after she delivered ten clutches of live chickens in the space of just two calendar years. He said that a really good hen might lay three clutches of chickens per year but that it was unheard of to have a hen averaging five clutches per year. In all, Marmalade delivered 181 live chicks during the course of her lifetime. Her most recent clutch of 13 live chicks was hatched just one month ago on 8 January. That was the 18th clutch of chickens hatched by the Red Mottled Leg-Horn Hen in just four years. Mr Dolan said he was always very proud of Marmalade who was chosen to lead the St Patrick’s Day parade in town of Banagher last March and was even photographed drinking from a pint of Guinness on the day. Marmalade was fed a diet which included a helping of oatmeal every morning. The owner said that he always believed this was the key to the bird's amazing fertility. He noticed that Marmalade did not seem well earlier this week and she died in the arms of his daughter Emma late this morning. Mr Dolan said that he had hoped the hen might live for up to seven years and that he is heartbroken that she had died so soon. He added that he could not bear to have his prized hen buried on his farm. He intends to have Marmalade stuffed by a taxidermist and mounted in a glass cage at a cost of €900.